Ray Kelly is presenting a talk and slide program on the Newburgh/Walden Trolley on Wednesday evening 7:30 PM at the Jacob T. Walden House, 34 North Montgomery Street, Walden, NY. Our program is free and open to the public. Light refreshments follow the program. Hello, my name is Ray Kelly and I am a member of the Ontario & Western Railway Society in Middletown. 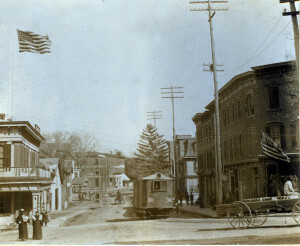 I am trying to put together a Power Point Presentation on the trolley that ran between Walden and Newburgh. If you have any photos or information you could share with me on this subject, it would be greatly appreciated. Since receiving this interesting e-mail from Mr. Raymond Kelly, and exchanging info over the past couple of months, our group has tried to locate more information–but a question still seems to remain–Is there an old trolley barn somewhere in Walden? We welcome your comments!